SigCap, The leading signatory management solution keeps getting better! With constant development and new features added constantly, 01 Systems presents you the best in class Signatory Management Solution. If you are on the lookout for an Enterprise Signatory Management Solution, then chances are that you already heard of SigCap. It was first released in 1988, and since then it has constantly evolved to cover all aspects of signatory management for different regions around the globe. In addition, SigCap has now evolved to serve your digitalization initiatives as well. New mobility features, advanced mandates controls, digital capture, built-in support for capturing and verifying customer biometrics, and many new features have been introduced to drive your digital transformation forward. Visit our SigCap product page for more information or you can always contact our Sales team who are more than happy to help you in answering any questions that you may have! 01 Systems supports automatic verification of customer signatures either online through biometric devices such as signature pads and tablets or offline by comparing existing signature specimens against a scanned document automatically. In offline mode, the signature from the digital document is analyzed and compared with an existing specimen. For example, verifying the customer’s signature from a cheque during the electronic cheque clearing process. The solution improves the speed and accuracy of signature reviews and minimizes manual efforts thereby reducing cost and manual labor. The solution provides an easy integration mechanism through WebService that can be called from any 3rd party application. The following sections explain the solution features and provide more insights on the factors that determine the accuracy of automatic signature verification solutions. Online signature capture and verification solution offers the ability to collect customer’s signature from biometric device and compare the biometric details (such as signing speed, pen movement, timing information etc.) against the stored customer profile. Based on the verification outcome the system automatically passes or rejects the provided signature. The solution combines the analysis of spatial characteristics as well as the behavioral biometrics of a handwritten signatures. It verifies the captured signature against multiple reference signatures (if available) in SigCap to determine random deviations in a person’s handwritten signature for enhanced verification quality. Additionally, the solution allows assigning confidence values that provide users with the ability to execute different scenarios of interpreting the results. The confidence value indicates how certain the verification process is about the match between the signature presented for verification and the corresponding reference signature. Depending on the confidence value chosen as a threshold, it is possible to change the percentage of “false accepts” and “false rejects” to tailor it to a specific application. Packed with all the feature you will ever need such as signature capture, document attachments, one click mandate, automatic synchronization of data with other system makes SigCap the #1 choice for a Signatory Management System. 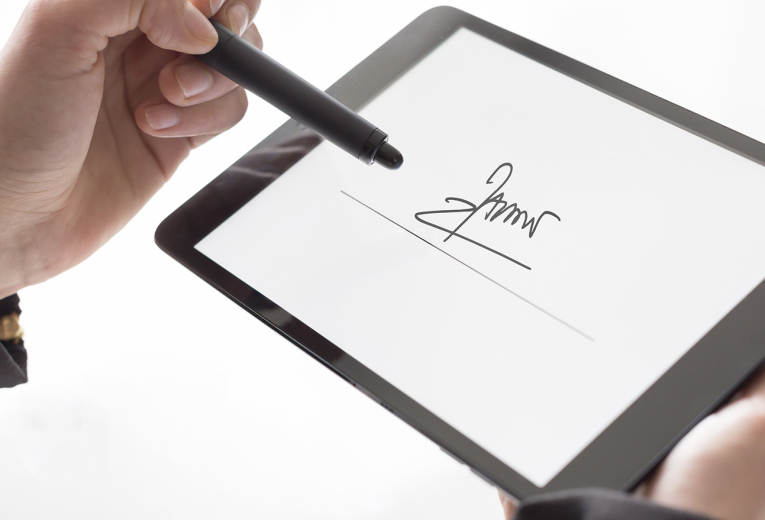 SigCap fully supports capturing of customer signatures from any medium, whether it’s through traditional scanning of signatures cards or through digital devices such as signature pads or signature tablets. It also features capturing of customer’s biometric details such as finger-vein and fingerprint specimens.